I like to plan things. Plan my day, my week, the month ahead, the year ahead and everything in my life. I don’t like waking up in the morning not knowing what’s there to do that day. Some say I’m a control freak. I bet to differ. I’ll rather say that I’m a planner. So I plan. I enjoy planning events and gatherings. From young, I always plan what my family will do on special occasions. When I’m in school, I plan how to make a project work. When I’m at work, I’m tasked to plan events, celebrations and all kind of activities. For the love of planning, I planned quite a few community events and I’m doing one right now. 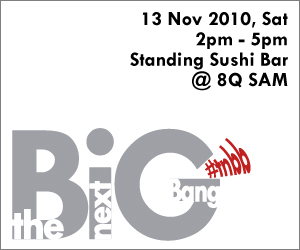 It’s happening on 13 Nov, Saturday from 2pm to 5pm at Standing Sushi Bar at 8Q SAM. This time round, it should be a cosy event where the greatest in their field, shares what to them is the next big bang – be it for the digital space or for the individuals who are looking at the next big thing to do for themselves. Looking at the list of topics and speakers, I sure am looking forward to it! I hope you can come join us too if you’re available that day. Especially if you are very much into the digital, social or new media spaces. As the venue has got limited sitting capacity, registration will close once it hits 60. RSVP early before its all filled! Why so difficult to make everyone happy? Thank goodness! Yebber’s back up!